Usually I get a scrappy challenge done within a week of finding out what it is, but this month I was too busy get ready for Michelle's birthday party, so this comes a lot later in the month. I flipped through some photo albums and found these older photos, from when Michelle was little and was finally old enough to help decorate the Christmas tree. She was so good about helping pass decorations and even carefully put some on the tree herself. She then started the tradition of being able to put the star on top of the tree. It's a bit heavy and the top of the tree isn't the greatest, so after she put it on, Daddy had to help straighten it up a bit. They both celebrated with a high 10! 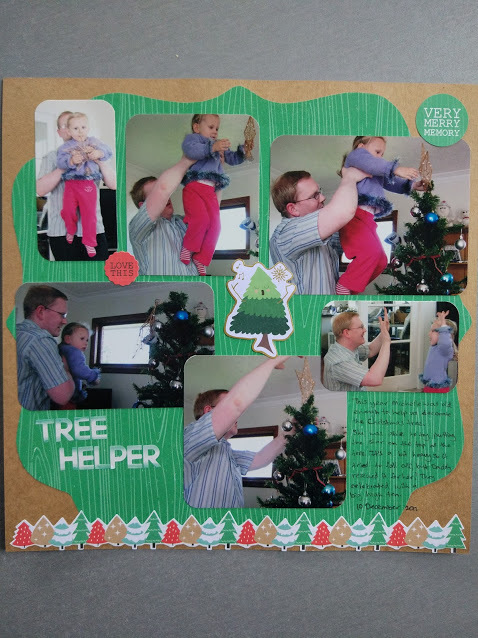 Oh such a lovely story about your photos and layout, so sweet, and wonderful Christmas memories.. thanks so much for sharing your layout with Kraft+ this month! This is such a lovely layout, with such beautiful memories. I do love the excitement of trimming the tree while they are young. Haha mine are too old now, it seems to have lost it's excitement. 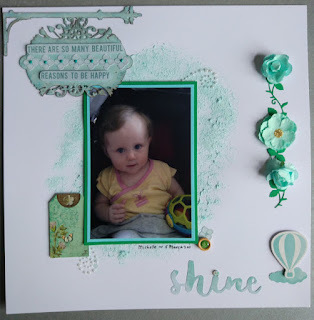 For September the colour challenge at White with One is Teal Sea. I used a mixture of modelling paste and Snow Cone gelato and put that on the sign in the top left corner. Some flowers and and other embellishments added to the page. Lots of lovely teal on the page. The colour for May is Gerbera Petal, a pink/red colour. Even though I left this til the last minute (last day of the month!) this was an easy enough colour to scrap. At the retreat last month I got the Kaisercraft Rose Avenue kit, which had just the right colour in it. I used a sketch I found online and was able to put this together quickly. Not the best photo as it's taken at night, and the title is a bit easier to read in real life. Still not doing much scrapping but got one layout done this month. The colour choice for August at White with One is Sunny Yellow. 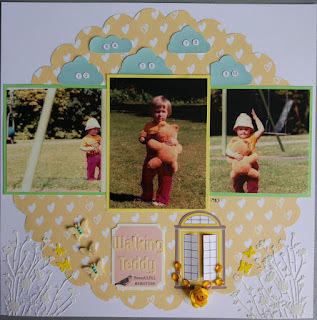 I found some old photos of me at the park with my teddy bear in a yellow tshirt, so decided to scrap them. A large scalloped yellow background paper, some plants with painted yellow butterflies, clouds with numbers and an open door.